These different looking foods or “ugly foods” are often left out of stores simply because they don’t look like the encyclopedia picture we’re used to seeing. WARSAW — The next time you’re in the grocery store, see if you notice anything strange about the fruits and vegetables there. All of the carrots are straight, the cucumbers smooth and the tomatoes round, right? This may seem normal, but to get these perfect fruits and vegetables over a fourth of perfectly edible – but not so pretty – produce is thrown away or rejected before you even have the chance to buy it at the store. A movement embracing the natural imperfections in food is taking off around the world. 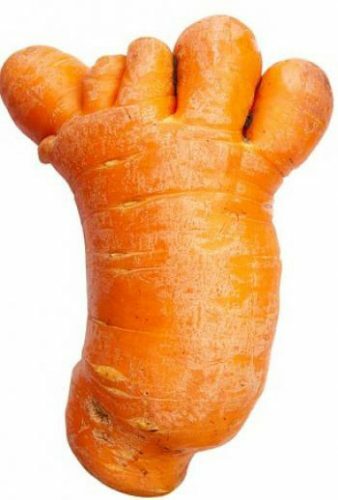 This movement could become part of the answer to the problem of food waste and fresh produce scarcity if consumers will simply purchase and eat this “ugly food.” Ugly produce is perfectly fresh, nutritious and delicious produce that looks a little different than the “perfect” stuff you will find in most grocery stores. Not only is good food being wasted before it can be used, but according to the USDA each year well over 100 billion pounds of food are thrown away in this country. This can be anything from food scraps, to rotted produce or even just leftovers that are forgotten about. That adds up to a lot of wasted resources! This food waste puts a strain on the environment by requiring more water and chemicals to produce, as well as increased emissions from harvesting and delivery to distributers who may reject them anyway. When we think of ways to be more environmentally friendly, usually recycling is the number one idea that pops into our head. If we apply the same, reduce, reuse, recycle (think compost), mantra to food waste, we could easily decrease landfill waste, increase food availability and also save our water and soil resources! Please join us at the KC Recycling Depot from 9 a.m. to 3 p.m. , Saturday, Nov. 12, for a special America Recycles Day celebration. Learn more about food waste and how to prevent it. Visitors will receive a reusable refrigerator bag to help prevent food spoilage (while supplies last). Participate in the Great Cupboard Cleanout; search your pantry and donate food before it become waste. All foods will be donated to local charities. Check out www.kcrecycling.com for full list of activities.